The XTX50 regulator has four medium-pressure ports all mounted on a rotating turret, resulting in optimal hose routing while eliminating sharp bends in the hose.
" Unique over-balanced, diaphragm design - as the diver descends, the over-balancing feature allows the medium pressure gas in the hose to increase at a rate faster than ambient. This results in superior performance at depth.
" An environmental dry system keeps water out of the main spring chamber thus preventing ice buildup and keeping silt and contamination out.
" Pneumatically-balanced second stage results in smooth, easy breathing.
" The XTX purge buttons are large and easy to operate. A 2-stage progressive purge is used - press the purge on the side for a lower flow rate, useful where more control is required such as filling lift bags etc, then press in the centre for the full effect of the purge, i.e. when regulator clearing etc.
" The large venturi lever has a soft touch rubber grip, which makes it easier to locate and use. The lever reduces the amount of grit ingress and therefore resists any possible friction giving a smooth operation.
" Easy-to-grip opening effort control knob keeps the diver in control.
" The second stage is manufactured with active protection against infection as all molded parts are produced with an additive that kills MRSA, protects against E-Coli, bacteria and fungi, and is also very effective against viruses, mould, yeast and algae.
" A silicone exhaust valve improves the breathing performance of the regulator.
" The Comfo-bite mouthpiece virtually eliminates jaw-fatigue.
" A heat exchanger (patented) which surrounds the valve mechanism, dissipates the cold caused by gas expansion while drawing in the warmth of the ambient water. 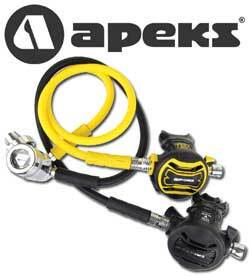 The XTX50 Octopus comes with high visibility yellow front cover and 36" yellow braided Flex-hose, suitable for cold water.